Born July 25, 1895, in Rochester, NY, to Dr. William L. Conklin and his wife, Alice Dunn Conklin, Ruth E. Conklin earned a B.A. from Mount Holyoke College and an M.S. in Physiology from the University of Rochester. After obtaining graduating from Rochester in 1921, Ms. Conklin worked as an Instructor at the Connecticut College for Women in New London, Connecticut. She came to Vassar a few years later as an Instructor of physiology. In 1927, she was granted a one-year leave of absence to study under Dr. Cecil K. Drinker at the Harvard School of Public Health and Harvard Medical School. 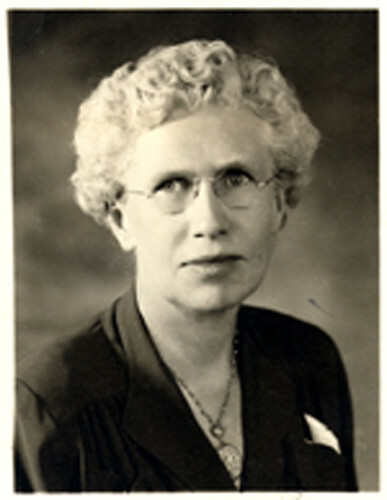 The leave was quickly extended to three years, and in 1930, Ms. Conklin earned her Ph.D. from Radcliffe College, the women's college affiliated with Harvard. Ms. Conklin's research focused on circulation and respiration, especially in reference to the lymphatic system. When she returned to Vassar, she became Assistant Professor of Physiology, and continued to make contributions to her field. In the summer of 1931, Ms. Conklin traveled to Copenhagen on a Vassar Faculty Fellowship to study osmotic control of animals with Nobel-prize winner Dr. August Krogh at his revolutionary Zoophysiological Laboratory. She applied her expertise through membership in a wide range of societies, including of the American Association for the Advancement of Science, the American Physiology Society, and the American Society of University Professors. Back at Vassar, Dr. MacCracken was busy promoting an expansion of the foreign student enrollment. Ms. Conklin avidly supported his initiative with articles with articles in the Vassar Alumnae Magazine, and she personally boarded many international students in the home she shared with Katherine DeWitt on College Avenue, fondly called the "International House" by the Vassar community. She brought young women from India to Vassar to serve as her part-time assistants in a program that gave budding scientists the opportunity to earn their Masters from the college in exchange for work in a Vassar science department. During World War II, Ms. Conklin became chairman of the ad hoc Committee for Academic Refugees, guiding the Vassar College plan of hospitality to best serve European academics that had been forced out of their positions by the war. Ms. Conklin also devoted herself to activities within the Poughkeepsie community. She judged the Poughkeepsie High School science fair in 1959, and served on the Advisory Committee of the Arlington School District Adult Education program. She was a member of the Dutchess County Council on World Affairs as well as the National and New York State Societies for Medical Research. She served as a trustee of the First Congregational United Church of Christ in Poughkeepsie, and chaired the church's Vietnamese Refugee Committee. Ms. Conklin delivered food through the "Meals on Wheels" program and volunteered with the Red Cross Blood Program. When she retired in 1961, Ms. Conklin devoted herself to her community activities. She taught a Physiology class through the city's Adult Education program and chaired the music committee at her church. In 1964, she traveled the world visiting students and associates from Vassar that lived as far away as Prague, Madras, and Hong Kong. Throughout her retirement, she maintained her ties with Vassar and her alma mater, Mount Holyoke. She died March 3, 1988, at 92 years old, after a long life serving the college and the community. Conklin, William D. "Ruth E. Conklin" in Vassar College and the Rochester Region, ed. William D. Conklin. Poughkeepsie, NY, 1985.